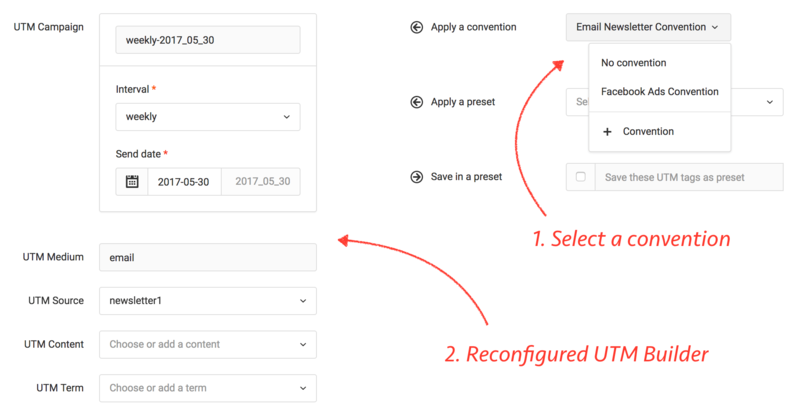 Add multiple URLs, choose existing UTM values, create new ones, use a preset to quickly populate common UTM settings, or create a new preset. Everything is designed to help you follow your naming conventions and avoid mistakes. You can even customize it for your own specific needs. 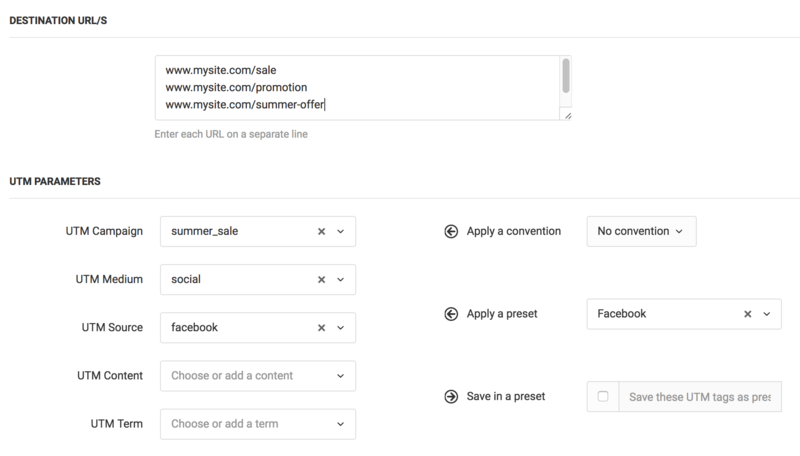 Use our Multi-Tag URL Builder to create all the tracking URLs you need in as little as 2 clicks. Your UTM conventions should not just be in your head or some document. Make them part of your own customized UTM builder. Define conventions specific to different channels, products, or anything else you need. You are not limited to UTM parameters. Define any number of custom parameters to enhance your tracking. Use our redirect codes feature to add people to your retargeting lists when they click your short urls. Segment your audience based on URLs they click even if you are sharing someone else's webpage. Terminus automatically checks if your original URLs are reachable. Avoid sharing broken webpages with your potential customers. This also helps you catch any typos or copy-paste mistakes early on. Use color-coded labels to organize your URLs. It has always been difficult to add UTM tracking to emails. Just write your emails as usual and Terminus will generate UTM tracked email in seconds. It will even auto-detect UTM Content values. It's compatible with most email service providers including Mailchimp, AWeber, Constant Contact, Drip, and others. Define and export Adobe Analytics classifications and Google Analytics data sets using any number of columns. Build URLs normally and export the mapping to your analytics tools. and still be able to see all the campaign, medium, source, etc. in your analytics reports. Terminus helps make your analytics reports accurate with UTM parameters. But you can also get a quick glance at how your campaigns are doing within Terminus. Just share your short URLs as usual and Terminus does the rest. There's nothing to install on your website. Save time and effort by building bunch of URLs at once. Our import tool will help you bring your exsiting UTM URLs in minutes. Your URLs will be automatically shortened. No copy-paste or any manual work needed. Copy any tracking URL with 1 click and use it anywhere. Notes help you and your team keep track of details for future reference. Use our Info Fields feature to create your own custom notes. Build new URLs based on old ones. Save time and avoid mistakes. Share URLs on social networks with one click. We'll even detect the relevant social network based on your URL and highlight it for you. All of your URLs are searchable. Search based on UTM parameters, destination URL, notes, etc. Easily export all or any subset of your URLs. Share it with vendors or use it with other platforms. 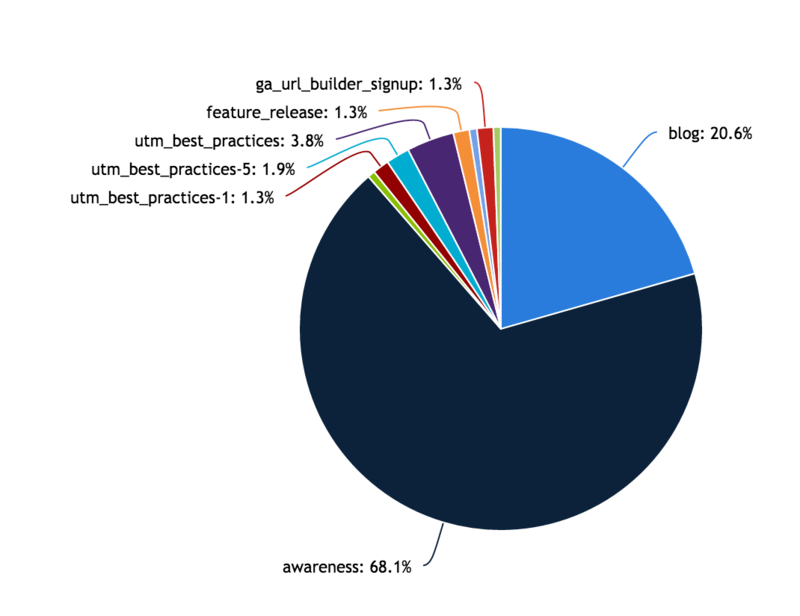 All of your UTM parameters are saved as you build URLs. Helps you manage all of them in one place. Auto-complete any UTM or custom parameters as you type. Greatly reduce typing mistakes. Any unused or expired UTM parameters can be deactivated. For example, you can use it for time-limited campaigns. Google Analytics and other analytics tools are case sensitive. Enforce lowercase with just one setting and avoid the most common mistakes in UTM naming. 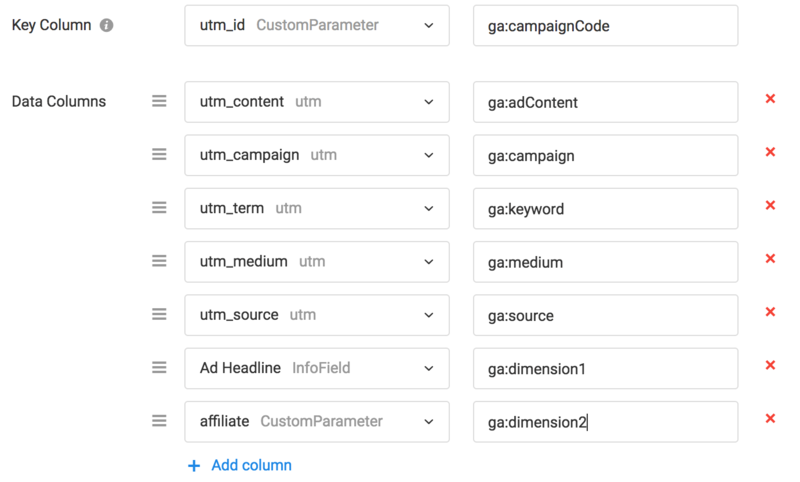 Group UTM parameters into meaning full sets for quickly building URLs. e.g. use Google Adwords to quickly populate medium, source, term, etc. Our email building tools help you easily add UTM tracking to all URLs in any email. Track emails created in Mailchimp, AWeber, ConstantContact or any other email service provider. 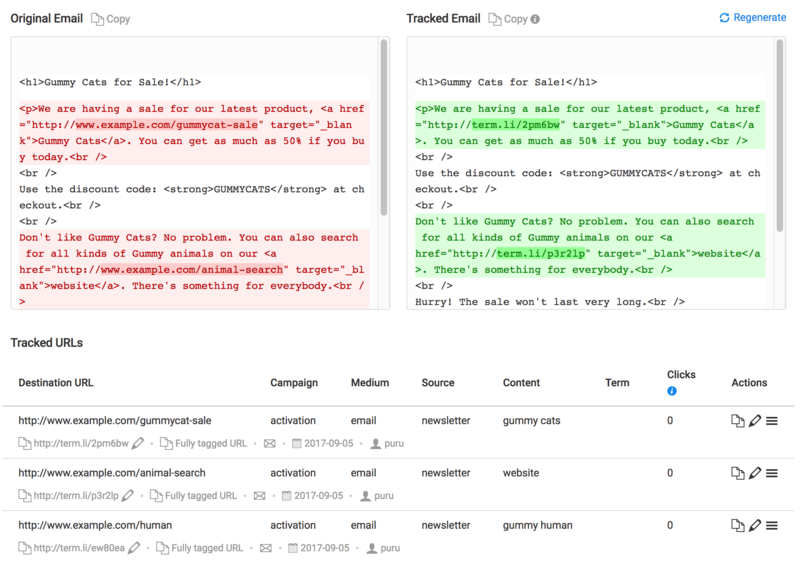 See click stats for every email and URL you track. Use your own branded domain to shorten URLs. Helps you retain your brand value when sharing short URLs. Add people to your retargeting lists or trigger any tracking code during a short url redirect. Some shorteners allow anyone to see the metrics on your links by adding "+" to the short URLs. Our shortener will keep your metrics private. Quickly identify the most effective campaigns, medium, sources, terms and contents. Filter on one or more campaign parameters to get more insights. Download reports in CSV format for further analysis in any spreadsheet. We filter the most bot traffic automatically. So your reports mostly consist of visits by real people. Control what changes each team member can make. Decide who is allowed to create URLs, change project settings, etc. Keep track of who created which URL and UTM parameters. Create new projects based on existing ones. Connect your own Bitly account and use it to shorten URLs. 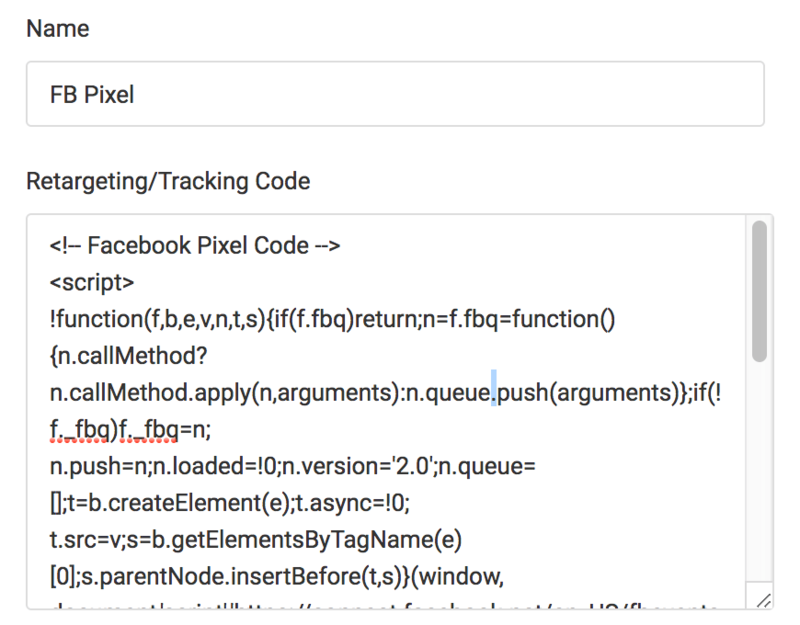 Replace all the spaces in your UTM parameters with underscore (_) , dash (-), or any character of your choice.